Authorities found graves in the municipal dump Cocula. 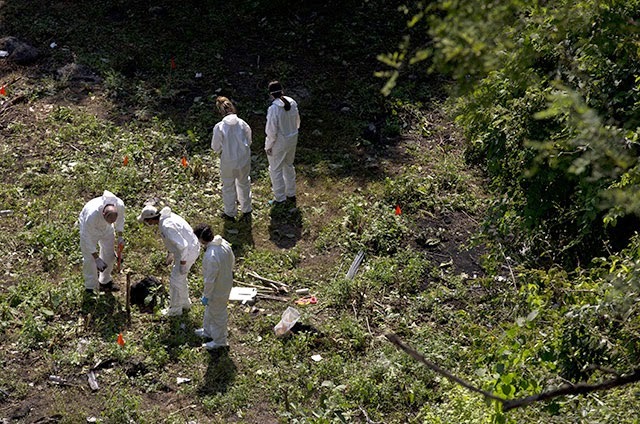 On the perimeter of the city dump Cocula new graves were located, prompting a police deployment and the direct participation of the Navy, whose elements resguardaron place and prevented access to anyone outside the OS. To reach the site, you need to cross a dirt road about 10 miles after the colony Vicente Guerrero, practically on the margins of the county seat. The discovery of these new graves sparked a rumor that these were the corpses of 43 normal school. In the morning, depending on the version of the experts themselves from the Attorney General's Office (PGR) that are part of the operation, perimeter landed a helicopter they were traveling in the head of the agency, Jesús Murillo Karam, and the holder Agency of Investigation, Thomas Zeron. At the entrance to the city dump was a marine fence that prevented the entry of reporters. A group of journalists surrounded the hill, and they explained some details of the graves: a kind of ravines where the experts had to rappel down with ropes. A federal prosecutor, who asked not to be named, said that to disclose the information that was conceived here, destabilize public order, and could have implications even nationally. In the county seat, located about 20 minutes away, the presence of the Federal Police and the National Gendarmerie was evident, but the median attack happened to a group of reporters from Televisa. The version of one of them is that men on a gray Jetta came down with heavy weapons, surrounded the vehicle and struck the windshield and the glass of the pilot. The video of the incident was later posted on the social network Youtube. The operation was much larger than that made on the slopes of Cerro Gordo, Iguala, when they found the first graves. The events occurred a month normalistas assault at the hands of the municipal police of Iguala, and one day after he took the acting governor Rogelio Ortega Martínez. 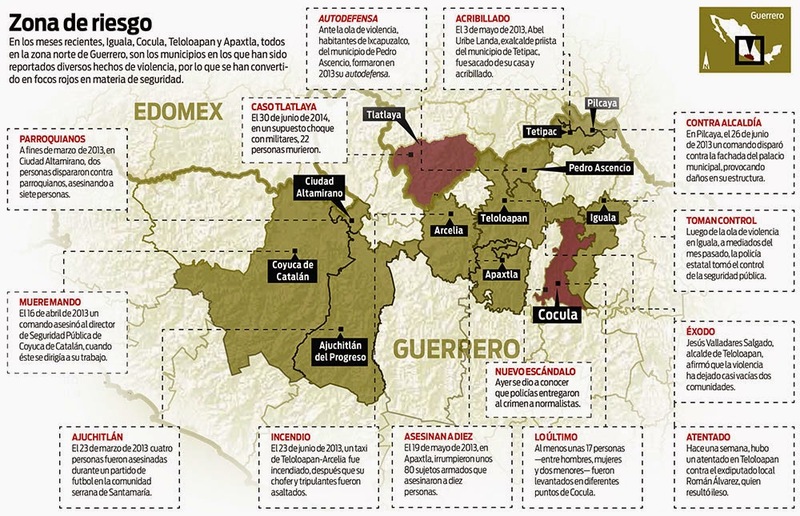 In Mexico City, meanwhile, reported that federal authorities arrested Monday to four members of the criminal group Warriors States, two of whom were directly involved in the kidnapping of 43 normalistas Ayotzinapa the night of the 26th and early 27th September in Iguala. In a meeting with representatives of the media in which no questions were allowed, Jesús Murillo Karam, head of the Attorney General's Office (PGR) said that now all four detainees are interrogated by prosecutors from the Attorney Specialized Investigation of Organized Crime (Seido), but gave no details of both the name of the detainees and the content of his statements. He said that for now the experts of the PGR and Argentina are working around the underground pit that was located this morning in a city dump Cocula Guerrero about 30 minutes of Iguala.